With Forever One moissanite engagement rings being so popular, we decided to add a Forever One moissanite wedding ring section to our website. These rings have become quite popular as well! Currently we are offering five stone moissanite rings as well as moissanite eternity rings. 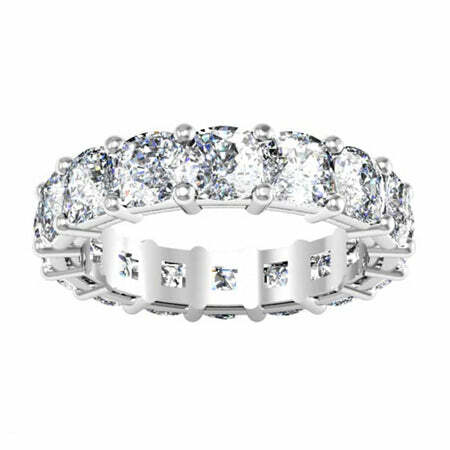 All the moissanite wedding rings we sell are available with Forever One moissanites from Charles & Colvard. Be sure to consider a moissanite wedding ring, especially if you have a moissanite engagement ring! 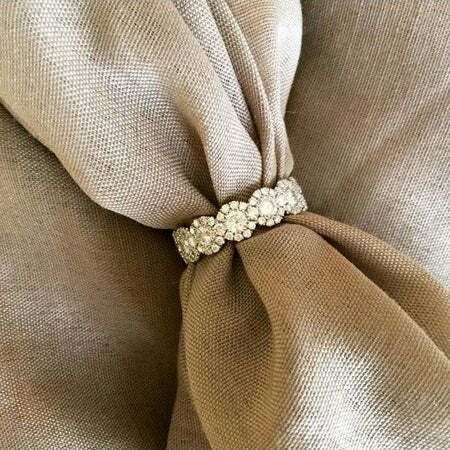 This 4.5mm Forever One moissanite cushion eternity wedding ring is breathtaking! We recently manufactured this for a client and she was thrilled when she saw it. This particular moissanite eternity ring is the diamond equivalent of 7.50cttw. It’s really quite impressive! Currently retailing for $4,630 in 14kt, the 7.50cttw cushion cut diamond equivalent would retail for over $25,000.00. 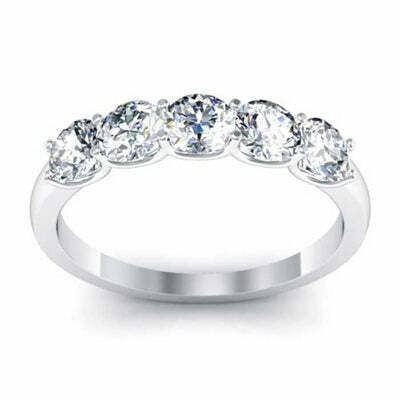 Also, always keep in mind that we can make a custom moissanite eternity ring. The particular ring features 13 Forever One round moissanites surrounded by 117 round brilliant cut diamonds. Have you ever thought to combine moissanite and diamond into your ring? This moissanite and diamond ring is stunning! If you want a more classic five stone ring, look no further. This particular Forever One moissanite five stone ring features 3.5mm rounds with a total DEV of 0.80cttw. Many women choose five stone rings as their wedding rings as opposed to an eternity ring. We currently have a few different carat weight variations for our five stone moissanite rings. Be sure to consider moissanite when thinking about your wedding ring. We are always adding new styles and can always custom manufacture a moissanite ring for you if you do not see what you are looking for on our site. With so many options, you are bound to find the perfect Forever One moissanite wedding ring! Happy shopping!